I Got A New Look! What a great way to start of the new school year with a blog makeover! I love my new look. You can thank Brittany from Gallery No. Eight for that! She redesigned my previous blog design and I asked her to work her magic again. There are few linking issues but other than that, I think it fantastic!!! Not only is she a fabulous blog designer, but she is one of the nicest people I know. I had the privilege of spending a few hours with her when I visited Toronto for last year's Blogpodium. It was fun to meet the amazing Brittany in person. Soft spoken and modest, she is incredibly talented. I am glad Jennifer Flores thought so too, Brittany is speaking at Blogpodium this year. Sadly I am unable to attend the fabulous event that just keeps growing. But I wish Brittany all the best as she wows the audience with her Photoshop know-how. 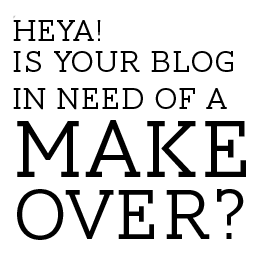 If you need a blog makeover, drop Brittany a line. She is incredibly patient and always seems to nail what my vision is. She even used a font she created on my blog. My menu links are created with her font she called Paris. And Brittany has come out with an ebook called Blog Design Essentials: Where To Start. Enter here to try to win a copy! Or for $5 it is yours! Love the new look! Will keep her in mind for sure! I love it Barb! It's so you. Love it Barbara! And I use Brittany too - she is fab! Wish you were going to Blog Podium this year. Had so much fun with you last year. FANTASTIC Barbara! I saw e title and thought you got a haircut, but this is great. Have a wonderful school year and I enjoyed the instagrams of your summer with your family. Well done! I love the new look!! You've given me some inspiration, so merci! Have a lovely weekend Barbara. Hope to see you soon. You so know I'm all over this new design ..... er er .... black and white!!!!! Such simplicity .... LOVE IT! See you on Saturday. It looks great here Barbara!! Love it Barbara - looks amazing!